If you’ve bought anything from L.L.Bean recently you might have noticed their “Be An Outsider” campaign, encouraging people to go outside and enjoy the great outdoors. We spend 95% of our waking hours indoors, and half of those hours are at work. We are more productive, more creative, less stressed and happier outside. It just makes sense. Being outdoors puts us in touch with the way we spent most of our days until just a few hundred years ago. It’s time we got outdoors more during the workday, not just evenings and weekends. 86% of indoor workers would like to spend more time outside during the workday. 75% of indoor workers surveyed rarely or never take time to work outside. 65% said their job is the biggest barrier to spending time outdoors, and this included a number of inhibitors, including technology, culture and “inertia” (they get lost in a task at work and forget to go outside). Survey respondents claim good weather is the biggest motivator to get outside during the workday (51%). Other reasons include needing a mental escape (49%) or for a change of scenery (43%). Workers rated emotional and physical benefits to working outside higher than “increased productivity,” though many believe being outdoors during the workday improves that too. Workers claim they are most likely to do creative and relationship-based work outdoors and see less potential for work involving technology and equipment. 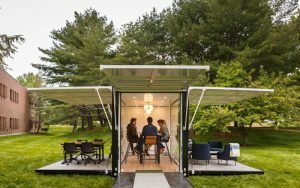 L.L.Bean’s outdoor coworking space will travel to Boston, Philadelphia, and Madison, Wis., in the coming weeks. Check out www.BeAnOutsiderAtWork.com to learn more and to see our latest research!